What's old is new again—at least when it comes to the varied group of grains collectively referred to as "ancient grains." The name ancient grains isn't a scientific, botanical, or even nutritional term; it's a description of a group of grains that have one thing in common—their long history of cultivation and use. According to Oldways' Whole Grains Council, based in Boston, ancient grains are those that have remained unchanged over the last several hundred years. Some say thousands of years. The category includes not only true grains, like teff, but also pseudograins, such as quinoa, and seeds, such as amaranth. Grains are small, hard seeds from a grass. Pseudograins are nongrass seeds that are used in the same way as cereal grains. Edible seeds are a larger category that includes grains, legumes, and pseudocereals. These ancient grains are rapidly gaining recognition and allegiance among consumers. The fourth annual "What's Trending in Nutrition" survey from Today's Dietitian and Pollock Communications, a food, health, and wellness public relations agency in New York City, asked 450 dietitians for their observations on what's hot and what's not. The survey showed that 50% of respondents said ancient grains would achieve "superfood" status in 2016 among consumers. According to a HealthFocus International survey, 35% of respondents in 16 countries in the Americas, Europe, and Asia have expressed an interest in ancient grains. And in another survey in the trade publication Packaged Facts, it was reported that almost one-fifth of American adults had purchased menu or grocery items containing ancient grains before being surveyed. The products containing ancient grains as an ingredient are as varied as the grains themselves. Today, ancient grains can be found in everything from cereals and crackers to pizza and quiche. They're even found in traditional favorites, such as Cheerios. There are good reasons for their rise in popularity. They're higher in protein than durum wheat; they're rich in vitamins, minerals, and phytochemicals; and they're high in fiber. Some are gluten-free. And many ancient grains can grow and thrive with less use of pesticides and fertilizers than wheat, and they require less irrigation, which means they have a decreased carbon footprint, making them ecofriendly crops as well. "The interest in whole grains and ancient grains has outpaced the interest even in gluten-free cuisine," says Kelly Toups, MLA, RD, LDN, program director of the Whole Grains Council. Their popularity continues to grow, despite the higher costs of ancient grains compared with traditional grains like wheat, oats, and rye. In fact, the 2016 Culinary Forecast from the National Restaurant Association, which surveyed 1,500 chefs, found that 68% of respondents cited ancient grains as a "hot trend." It ranked No. 15 in the top 20 food trends. Here's a sampling of ancient grains that are growing in popularity. A native crop of Peru, amaranth was a major crop of the Aztecs, and is believed to have been cultivated thousands of years before that. Amaranth isn't actually a grain, but a seed of the amaranth plant. Amaranth is the name of the more than 60 species of amaranthus plants. Only three are grown for food. Amaranth first began to attract interest in the United States in the 1970s and slowly grew until it reached its peak presence today. While harder to find, the leaves of the amaranth plant are also edible and are used in Asian and Caribbean cuisines. Naturally gluten-free, amaranth is a source of protein, about 4 g per cup, cooked, and it contains the essential amino acid lysine, which is found in lower amounts in most other grains. Amaranth also is a good source of iron, magnesium, and phosphorus, and provides smaller amounts of calcium and potassium. Several studies have found that including amaranth in the diet can help lower blood cholesterol levels, possibly due to the phytosterols it contains.1 A research review of amaranth cited that stimulation of the immune system, antitumor activity, and a reduction in blood glucose levels are associated with intake.2 A wide variety of products are now available that contain amaranth, such as Arrowhead Mills Amaranth Flakes breakfast cereal; Plum Organics Mighty 4 Kale, Strawberry, Amaranth Greek Yogurt; Plum Organics Mighty Veggie Spinach, Parsnip, Grape, Amaranth Vegetable and Fruit Smoothie; Plum Organics Zucchini, Banana & Amaranth; and Van's Lots of Everything crackers. An ancient Egyptian word for wheat, KAMUT is now a brand, registered as a trademarked strain of ancient wheat. Most KAMUT brand wheat is grown in the United States and Western Canada. There's also a Kamut Association of North America, formed to promote the use of KAMUT, provide consumer education about the grain, and encourage the expansion of organic agriculture.7 KAMUT is rich in antioxidants, including polyphenols and selenium. One-half cup, cooked, is a good source of magnesium, phosphorus, zinc, and niacin, and provides smaller amounts of potassium, but because it's a type of wheat, it isn't gluten-free and therefore isn't appropriate for clients and patients with celiac disease. It provides up to 40% more protein than modern wheat, and the grain's ability to grow well without chemical fertilizers and pesticides makes it a good choice for organic farming.7 Findings from animal research suggest that those fed KAMUT wheat bread had a better response to oxidative stress than those fed modern wheat.8 A clinical study found that consuming KAMUT products (bread, pasta, and crackers) for eight weeks resulted in significantly reduced levels of proinflammatory factors in the blood, compared with when they consumed semiwhole grain wheat products for the same length of time.9 A variety of KAMUT-containing products is available in the United States, including Dakota Earth Artisan Italian Pasta, Earth's Best Apple Plum KAMUT Wheat Infant Puree Pouch, Kashi Cocoa Coconut Granola with KAMUT Korasan Wheat, and Kellogg's Origins ancient grains cereals. A more complete list, including availability in other countries, can be found on the Kamut Association's website (www.kamut.com). Quinoa is believed to have originated and been successfully cultivated in the Andean region of Ecuador, Bolivia, Colombia, and Peru 3,000 to 4,000 years ago.8 Of all the ancient grains presented here, this dietary staple of South America, once considered sacred by the Incas, is likely to be the most familiar to clients and patients. While technically it isn't a grain, it's referred to as a pseudograin and is prepared and eaten like most other grain foods. Botanically, quinoa is related to beets, chard, and spinach, rather than wheat, barley, or rye.10 There are more than 120 varieties of quinoa, but the most commonly available are white quinoa, red quinoa, and black quinoa. They all are high in protein, which is rare among plant foods, the result of a germ that comprises 60% of the grain, compared with wheat germ, which accounts for only about 3% of the grain. It's also high in quercetin, a phytochemical that researchers suggest may be effective for managing type 2 diabetes.11 Quinoa is gluten-free, making it a good alternative to other grain products for people diagnosed with celiac disease or nonceliac gluten sensitivity. Studies also have suggested that consumers can improve the nutritional profile of their gluten-free diets by adding quinoa to meals and snacks, and increasing protein, iron, calcium, and fiber to their diet.12 Quinoa is an excellent source of magnesium and folate and a good source of potassium, iron, and zinc. A study from the University of Milan found that consuming quinoa pastas and breads produced lower triglyceride concentrations among a group of healthy volunteers, compared with other gluten-free pastas and breads.13 There are plenty of quinoa products to choose from, including Near East Quinoa Blend (Quinoa and Brown Rice), NatureCrops Quinoa Flakes, Simply 7 Quinoa Chips, Paul's Quinoa Puffs, and Ancient Harvest Bean & Quinoa Supergrain Pastas. Teff is a major source of nutrition for two-thirds of the population of Ethiopia. It's an ingredient in the spongy injera flatbread, which is an Ethiopian staple at mealtime and is common in other nearby African countries. Injera typically is made with fermented teff flour. Today, it's gaining in popularity and is recognized for its sweet, molasseslike flavor and versatility. Teff grows in three colors: red, brown, and white. The grain is high in resistant starch (about 20% to 40% of the carbohydrates), which may help control blood sugar, weight, and improve intestinal health.3 Unlike most other grains, the entire teff grain is whole, because the kernel is too small to mill (only about 1/150 the size of wheat kernels); therefore it can't be turned into a refined grain product. Three thousand grains of teff weighs approximately 1 g, according to www.teffco.com. Teff is a good source of iron, magnesium, and phosphorus, and provides lesser amounts of calcium, potassium, zinc, niacin, and folate. It's hard to find products that contain teff, though it's easy to find teff grain and teff flour with which to cook. Three good sources are The Teff Company, Bob's Red Mill, and Shiloh Farms. 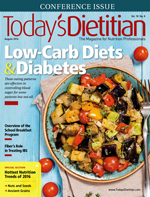 "These ancient grains represent a return to a more simple, wholesome way of eating," says Kitty Broihier, MS, RD, LD, owner of NutriComm Inc Food and Nutrition Communications. But she says that not all ancient grain ingredients are whole grain. Some are processed just like conventional wheat products—a fact that dietitians need to share with clients and patients. "The health halo around ancient grains may lead folks to think that anything containing them has got to be nutritious, which, of course, is not always the case. Label reading is still important," she says. Hot cereal combinations of ancient grains are the easiest to find online and in stores and the easiest to prepare. "Incorporating ancient grain flours into pancakes and waffles is a good way to get started cooking and including them in the diet," Broihier says. They can take longer to cook than rice or couscous, but she suggests using a slow cooker if time is an issue. 2. Caselato-Sousa VM, Amaya-Farfán J. State of knowledge on amaranth grain: a comprehensive review. J Food Sci. 2012;77(4):R93-R104. 5. Serpen A, Gökmen V, Karagöz A, Köksel H. Phytochemical quantification and total antioxidant capacities of emmer (Triticum dicoccon Schrank) and einkorn (Triticum monococcum L.) wheat landraces. J Agric Food Chem. 2008;56(16):7285-7292. 7. Quinn RM. Kamut®: ancient grain, new cereal. In: Janick J, ed. Perspectives on New Crops and New Uses. Alexandria, VA: ASHA Press; 1999:182-183. 8. Cooper R. Re-discovering ancient wheat varieties as functional foods. J Tradit Complement Med. 2015;5(3):138-143. 9. Sofi F, Whittaker A, Cesari F, et al. Characterization of Khorasan wheat (Kamut) and impact of a replacement diet on cardiovascular risk factors: cross-over dietary intervention study. Eur J Clin Nutr. 2013;67(2):190-195. 11. Ranilla LG, Apostolidis E, Genovese MI, Lajolo FM, Shetty K. Evaluation of indigenous grains from the Peruvian Andean region for antidiabetes and antihypertension potential using in vitro methods. J Med Food. 2009;12(4):704-713. 12. Lee AR, Ng DL, Dave E, Ciaccio EJ, Green PH. The effect of substituting alternative grains in the diet on the nutritional profile of the gluten-free diet. J Hum Nutr Diet. 2009;22(4):359-363. 13. Berti C, Riso P, Monti LD, Porrini M. In vitro starch digestibility and in vivo glucose response of gluten-free goods and their gluten counterparts. Eur J Nutr. 2004;43(4):198-204.